Three girls have been selected for the 2019 Sussex Cricket Girls’ Academy. A further five girls have been given places on the Emerging Players Programme (EPP). Cassidy McCarthy, Ella McCaughan and Ella Wadey form the Academy. Amie Anderson, Frankie Angel, Elise Jorgensen, Freya Kemp and Hollie Young are included in the EPP. The Academy players attend one-to-one training sessions twice per week during the winter and members of the EPP meet as a group for one batting and one bowling session each week. Within the EPP, Freya and Hollie will take part in a new ‘EPP Plus’ programme, which rewards players who have excelled over the previous summer and are deemed to be extremely close to an Academy place. EPP Plus players will receive an extra one-to-one training session every fortnight during the winter on top of their regular EPP sessions. Both programmes are based at the Sir Rod Aldridge Cricket Centre at Brighton Aldridge Community Academy (BACA) and are made possible by funding from the Aldridge Foundation. Sussex Cricket Emerging Players Programme 2019 Frankie is in her first year on the programme. 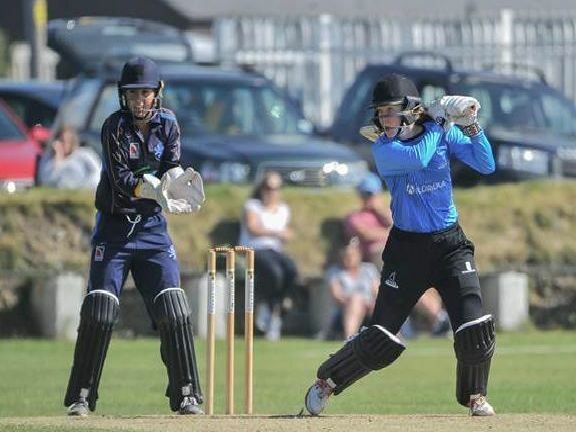 A goalkeeper for Brighton & Hove Albion and England at under-15 level, the 14-year-old took up wicketkeeping in 2018 for Sussex Under-15s and impressed with how quickly she took to the role. The Downlands Community School pupil is a top-order that also plays for Ansty CC. Sussex Cricket Emerging Players Programme 2019 15-year-old Amie is in her second year on the EPP. The Bexhill Academy pupil is a quick, left-arm seamer and right-handed middle-order batter that plays club cricket at Bexhill CC and Hastings & St Leonards Priory CC. Sussex Cricket Emerging Players Programme 2019 The youngest player on the EPP at 13 years old, Freya played in both the under-15 and under-17 teams in 2018. The left-arm seamer and top-order batter is a pupil at Bedes School. Sussex Cricket Emerging Players Programme 2019 Off-spinner, Hollie was the leading female wicket-taker for Sussex in 2018 with 35 dismissals and is in her second . The 15-year-old pupil at St. Richards Catholic College in Bexhill is also a top-order batter and plays at Ansty CC.